The subject of pensions is arguably one the most boring topics that you can talk to younger generations about. It is considered uncool and is mostly related to old people and finance. How could it get any less exciting? Many younger people do not seem to care one bit about pensions, and it is endangering their own financial futures as well as that of the pension system as a whole. So could Octalysis Gamification come to the rescue? Can we perhaps make (preparing for) pensions fun and engaging? The Octalysis Group just started some initial advisory for the UK Department for Works and Pensions to achieve just that. But why are they so interested in making pension systems fun and engaging? What has changed suddenly? My grandparents and parents surely did not need to be engaged. The population in the developed world is quickly getting older. This means that in the future, there will be more pensioners living off the tax contributions of others. In a sense, the pension fund acts like a benevolent Pyramid Scheme: it can only continue to grow if enough people keep contributing and the majority of the members do not take their money out of the system. So far this has not been an issue, but we have now reached a state where the collective contributions to the pension funds system are increasingly lagging behind the uptake by pensioners of these funds. Average pension ages are being increased rapidly to try to stop the bleeding. For my age group it is expected that we will be able to take pension at age 73. This is 15 years later than the age that my mother retired at! But will it be enough to save the system? Many doubt it. So with the future of the pension system (as we know it) in doubt, it is even more important that younger generations save more than their parents and grandparents. The problem is that they don’t. They save even less. Young people seem to have lost any interest whatsoever to start saving and governments around the world have no clue how to change it. Luckily the UK Government and its charismatic Minister for Pensions, Baroness Altmann, are forward looking. The Baroness has publicly stated that she thinks that Gamification is the way forward for pension systems. Last month we did some initial advisory to help her department discover what Octalysis Gamification can do to create engagement for pensions. In the 4 Experience Phases of Octalysis, the Onboarding Phase is where users find out why they even want to interact with your product. The product here is pensions (more specifically Workplace Pensions). In this phase we want to create curiosity based on something new and exciting that is also supported by other people we can relate to. At the same time, we want to create some urgency to act/buy now (rather than to appeal to a vague ‘Good Cause’). Unfortunately, Workie did not learn about Octalysis or Behavioral Science when he started his promotions, which meant the campaign was doomed to fail. In fact, the video already fails within 10 seconds. The commentator laments about Workie (the embodiment of Workplace Pensions): “…at the moment, unfortunately, people are ignoring him”. The producers try to appeal to Octalysis Core Drive 5: Social Influence and Relatedness, to make people want to act (out of pity). In fact, what they achieve is the opposite. If nobody wants to engage with Workie, why should anybody? In this case, anti-Core Drive 5 leads to Core Drive 8: Loss and Avoidance. 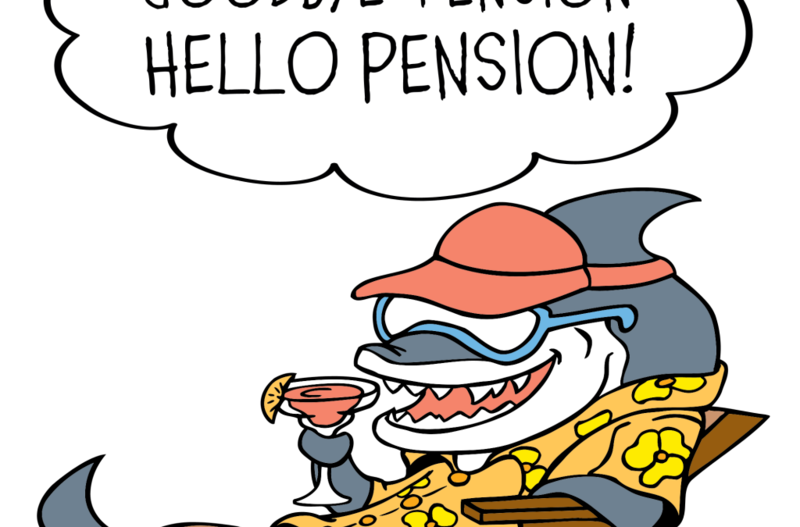 People have just become even less enthusiastic about pensions! In Yu-kai Chou’s book Actionable Gamification, Yu-kai writes about a National Park in Arizona that was trying to prevent people from stealing their petrified wood. In an experiment, when they put up a sign that says, “Many past visitors have removed the petrified wood from the park, destroying the natural state of the Petrified Forest,” theft of the petrified wood not only did not decrease, it nearly triple! That is because when people see that it is the Norm that people are stealing, they think they should steal too. So does the video at least bring anything exciting or a promise of future benefits for citizens? Strangely enough no. In the full 42 seconds clip there is no promise of anything that would make me feel accomplished or excited. There is no Core Drive 2: Development and Accomplishment. In addition, the only thing that is (initially) mildly exciting, is Workie itself as he looks somewhat novel (but not necessarily slick or likable for a younger generation). But since he is actually a boring, slow-trotting and negative character, that excitement wears off within seconds. So we are left with no Core Drive 7: Unpredictability and Curiosity push, and the lack of excitement adds to Anti Core Drive 8: let’s not waste my brain cell and valuable time to care about what this character has to say. In fact, if there should be Core Drive 8: Loss & Avoidance (which generally drives urgency which is good), it would be much better to show negative consequences of these people ignoring Workie . “Look, everyone is ignoring Workie. They don’t care. But oops! Look what happened to them later.” The fear tactic should not be about making the government sound evil, but from the actual negative effects of such behavior. Also, we know from Behavioral Science that when there is a fear tactic, there MUST be a simple direct action item that alleviate that fear, or else people move into denial mode and prefer to not think about it. At the end, the narrator talks about the website to learn more about the workplace pension, which is good. However, the Desired Action can be more clearly presented on the screen, as opposed to the passive message, “Don’t ignore the workplace pension.” It should be actively telling them to visit the website now with large fonts, preferably with a friendlier shortcut URL. We know that every action that the brain can’t comfortably process will hamper conversion rates. Having a long URL will create that cognitive dissonance and make people who have an intention to do something procrastinate until later (until they retire?). It is better to have a shorter link such as VisitWorkie.co.uk that continues on the story of Workie and how the audience can help him make the future better for everyone. Baroness Altmann, the Minister of State for Pensions recognized the failings of the previous campaigns. She has come out as a fan of Gamification and we think that is a smart move. Pensions is a boring topic, so it is not easy to create engagement around the theme, based on content alone. You need to make the experience surrounding pension systems more engaging and Octalysis Gamification can help. Just as we have achieved with other Governments Institutions and companies, the key lies in making the experience so engaging that people hardly feel they are focusing on pensions. It is the experience around it that creates the engagement push. The interaction with pensions will now lead to win states in the game, so all of a sudden it becomes fun and rewarding to deal with planning your financial future. We have designed Gamification for all sorts of boring and “unsexy” topics, ranging from healthcare all the way to SEC compliance training for financial firms. Before our designs, people would only learn about these rules because their boss told them to do it (Core Drive 8, you do it because you are afraid to lose your job or promotion). Now they learn in fun ways and even are excited to interact with the content when they are not at work! It is not yet clear where our contacts with the UK Government will lead to. It would be great if the UK Government and the Octalysis Group could work together and resolve these challenges in engagement. Octalysis is ready to play its part. Pension systems are essential for societies. We are happy to help avoid a future where the elderly have no money and have to rely on family and friends to survive. Let’s use the power of Octalysis to prevent this dreaded image from ever becoming a reality. Haha – this is so funny and coincidental. I was only yesterday watching the advert with the big, stupid, multi-coloured furry workplace pension thing, and thinking to myself “Well now I’ve been looking at Octalysis I can see how this ad campaign will never work. They’re saying he is friendless and ignored, so why would anyone else want to engage with him?” I didn’t know that you’d already looked at it and drawn the same conclusions.